I FELT like a VIP, traipsing through a two-storey town house to enjoy a sauna in one of the three bathrooms provided. 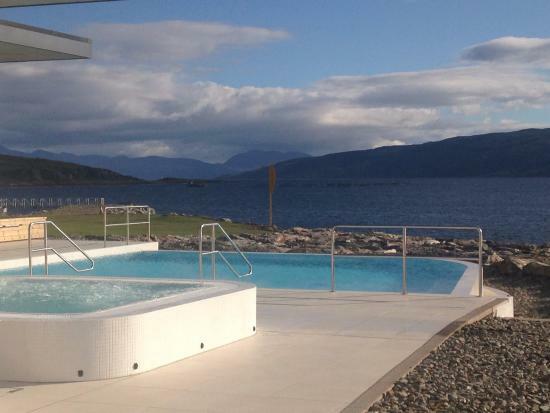 I was spending a luxury spa weekend at Portavadie Marina, a resort on the west coast of Scotland, which opened in summer this year. And despite it being a cold, rainy winters day, it felt like I was holidaying in Scandinavia somewhere, supping prosecco whilst turning myself into a lobster in the provided outdoor hot tub. The outdoor hot tubs provided the ultimate luxury experience. The new facilities at the five-star complex were built as part of a £10m development, creating a truly unique destination in a stunning location. Upon arrival, my jaw dropped in wonder at the modern, glass-fronted town house apartments, which boast two bathrooms, one en suite bathroom, a fully-kitted kitchen, living area and three bedrooms. Plush isn’t enough to describe it — even the floors are heated in the bathrooms and the double beds are worthy of a king. Promising a weekend of relaxation and rejuvenation, guests can enjoy spa treatments, a gym and swimming area and of course — the main attractions — two heated, 33C, outdoor pools. Described as one of Scotland’s ‘secret ports,’ the experience is unforgettable and is fast becoming a holiday resort for families across the country. 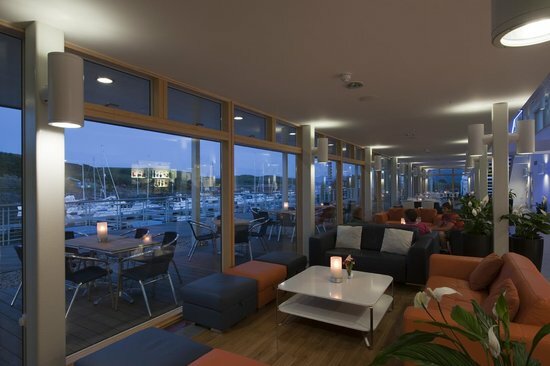 On the first night of my stay, I get to enjoy a delicious dinner at the Marina restaurant, a dining area situated on the waterfront which serves an array of traditional Scottish meals. This is shore dining at its finest, with favourites such as seafood, black pudding and scallops on the menu for those who enjoy the finer things in life. 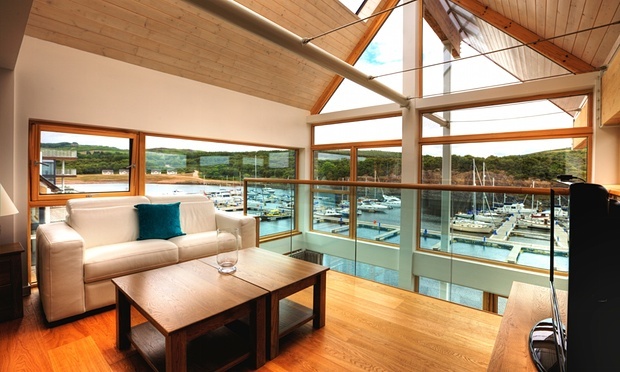 Sitting on the shore of Loch Fyne on Scotland’s west coast, Portavadie is a contemporary gem set amid stunning scenery. 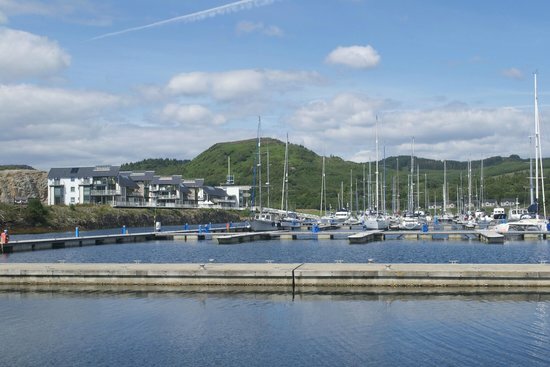 Surrounded by hills, lochs, forests and glens it is a haven of modern comfort with five-star luxury apartments, self-catering cottages and loch-side restaurants and bars. For the more adventurous folk, a range of activities are available including: mountain biking, walking, sailing, rib rides, kayaking. I preferred to sit back and bask in the scenery instead. With no phone reception available, it was the perfect way to switch-off. Available to all guests and day visitors, the complex features therapeutic spa treatments, a hydro pool, steam room and a relaxation space, all with breathtaking floor to ceiling views across Loch Fyne to the Isle of Arran. But one of the most pleasant part of the experience is the customer service provided by spa and leisure manager Stephen McCafferty, who brings a wealth of expertise, having worked for some of Scotland’s finest locations including Cameron House and Macdonald Hotels. Stephen is friendly, helpful and clearly knows the business. On arrival at the spa, he informs us all about the Decleor and ishga product houses used for each of the luxury treatments. As part of my package, I enjoyed an indulgent, invigorating massage and facial which helped me relax, release tension and nourish my skin. The experience was truly unique and the facilities provided are like no other in Scotland, something backed up with several members of the staff who live there. Iain Jurgensen, general manager, said: “We have been on a journey of discovery in creating this world class Spa and Leisure Experience at Portavadie, driven by our passion to create something truly special for our guests to enjoy time and again. “It is a wonderful light-filled, modern facility that brings something totally unique to the west coast of Scotland. The two-hour journey from Glasgow was well worth it for this once-in-a-lifetime experience. And I doubt this incredible coast will remain a ‘secret’ for much longer if its guests have anything to say for it.